Premiere – a premiere screening, with price 12.00 EUR. Normal – a standard screening, with price 7.50 EUR. Discount – a screening for children and students on a reduced price – 5.00 EUR. Write a program that enters a type of screening (string), number of rows and number of columns in the hall (integer numbers) and calculates the total income from tickets from a full hall. The result has to be printed in the same format as in the examples below – rounded up to 2 digits after the decimal point. While reading the input, we could convert the screening type into small letters (with the function .ToLower()). We create and initialize a variable that will store the calculated income. In another variable we calculate the full capacity of the hall. 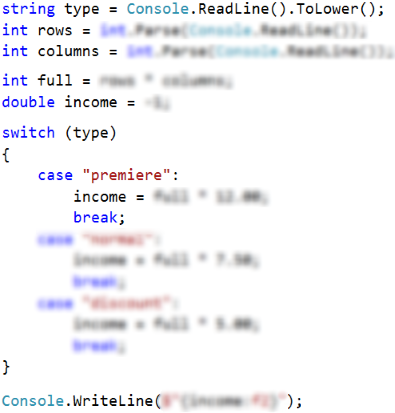 We use a switch-case conditional statement to calculate the income according to the type of the projection and print the result on the console in the given format (look for the needed C# functionality on the internet). Test your solution here: https://judge.softuni.org/Contests/Practice/Index/508#10.